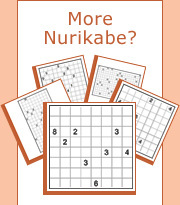 Following the footsteps of Sudoku and Slitherlink, Nurikabe is the next family of easy to learn addictive logic puzzles which were invented in Japan. Using pure logic and requiring no math to solve, these fascinating puzzles offer endless fun and intellectual entertainment to puzzle fans of all skills and ages. Nurikabe (hiragana: ぬりかべ) is a binary determination puzzle named for an invisible wall in Japanese folklore that blocks roads and delays foot travel. Nurikabe was apparently invented and named by Nikoli; other names (and attempts at localization) for the puzzle include Cell Structure and Islands in the Stream. According to Wikipedia Nurikabe was first developed by "reenin (れーにん)," whose pen name is the Japanese pronunciation of "Lenin" and whose autonym can be read as such, in the 33rd issue of (Puzzle Communication) Nikoli at March 1991. It soon created a sensation, and has appeared in all issues of that publication from the 38th to the present. As of 2005, seven books consisting entirely of Nurikabe puzzles have been published by Nikoli.